Archery is a sport that the whole family can participate in, it's skilful and enjoyable. There are different types of archery, target archery being the one you're probably most familiar with. This involves firing a set number of arrows at large round targets (Bosses) from different distances. Field archery normally takes place in woodland where targets representing, birds, animals, and even sometimes mythical creatures are set up around a set course.A group of five archers follow each other at a safe and monitored distance around the course and have to hit the targets. Clout shooting is a form of archery where a target is placed on the ground face up and shot at from a distance as far back as possible. In competition the distance is 180yds for men and 120yds for women. The arrows are fired skyward in the hope that they hit, or at least land somewhere near the target. 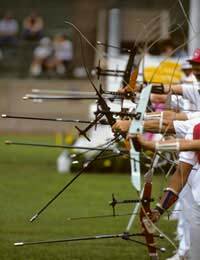 No matter what form of archery you participate in it's important to remember that a bow if used carelessly can cause serious harm and safety rules should be applied whenshooting. A common sense approach to safety should always be taken, and no one should be put at any risk by foolish or inconsiderate actions. Never point a bow and arrow loaded or unloaded at another person. You should only point your bow at the target. It's not a toy it can cause serious injury. Don't shoot an arrow straight up into the air, you don't know where it's going to land. You could hit another person, or yourself. Never shoot an arrow into the distance not knowing where it might land. It's possible you could hit someone if you do this. Children must be supervised at all time. Even if they are not shooting, they should be supervised to make sure they don't stray into the path of an arrow. Targets should be set up in such a way that no person can be hit by a stray arrow. Backstops or nets should be used wherever possible. Check your arrows regularly for damage. If you find any that have defects break them to avoid using them accidentally. Bowstrings also need to be checked regularly and if damaged replaced. The Bow should be checked for twisting or cracking. If it's damaged in any way don't use it. Inexperienced archers should not shoot without supervision. Always make sure the arrows you use are the correct length for your bow. If you are unsure-ask! Don't draw the bowstring back, or release it if there is no arrow on it. This can result in damage to the bow. No one should stand at the target end when shooting is taking place, no matter how far off to the side they might be. If two or more archers are shooting they should stand side by side. Never stand in front of anyone who is shooting. Before walking to the target to retrieve arrows make sure everyone has finished shooting. When pulling arrows from the target make sure nobody is standing behind you or they could get the rear end of an arrow in the eye or face. Never draw the point of the arrow back inside the bow. If you do, the arrow can snap when released and pieces could stick in your arm. Don't jerk the string back when you shoot as this can cause the arrow to be drawn back inside the bow. Stop shooting if there is the slightest chance of anyone crossing in front of you or the target. Never step forward of the shooting line. Never run towards the target. Walk slowly looking for arrows that may have fallen short. If you step on one you could end up getting injured. These hints are by no means the only safety aspects of archery you will need to be aware of to make your day enjoyable and free from incident, but they will help in making you aware of the commonsense attitude to safety that needs to be adhered to when shooting.